"I am the Guggenheim" exploits the notions of interaction and information collected from the visitors in order to fabricate the museum's spatial experience. It takes into account the obsolescence of new interactive technologies and creates an open infrastructure that allows for the museum to be flexible in order to accommodate for artistic and technological unpredictability. It is composed of a system of plugged in programs of gallery exhibitions, theatre, education and various production functions. The Guggenheim is envisioned as a cultural think tank in Helsinki with an interface that is non-cultural: the everyday human interaction and the city. 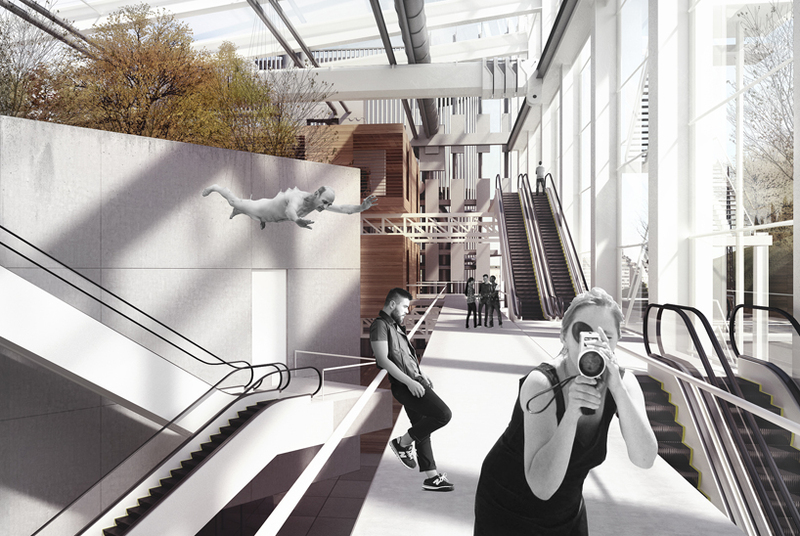 By taking the public space and delivering it in a different way, we create an exchange that threads the public into the museum, using all the surfaces for defining the play of the institution with its environment and immediate context. we’re trying to bring park culture, port culture, city culture and museum culture together. Helsinki’s historic center is embedded in the orientation of main gathering spaces in response to the street grid. Located in Etelasatama at the edge of the city, the glass façade enables a visual play between structure and nature in response to the Tahtitornin Vuori park, both unifying and separating the gardens from the vehicular tracks. The trees from the forest atrium read behind the transparency of the façade, adding ambiguity to the transition from outside to inside. A bridge from the park pierces through the building alongside the mechanical wall to catch the sea side passerelles. A walk from the market alongside the water deck takes the visitor on a journey up the building to reach the rooftop restaurant of the technical tower. The museum is set back on the north opening up a public esplanade that takes you to the main entrance of the museum, under a kinetic urban office façade. The open structure creates large flexible areas that are made possible by the structural beams, which span the whole width of the museum. Gallery modules are fabricated with local timber, including adjustable louvers at the exhibition façades.